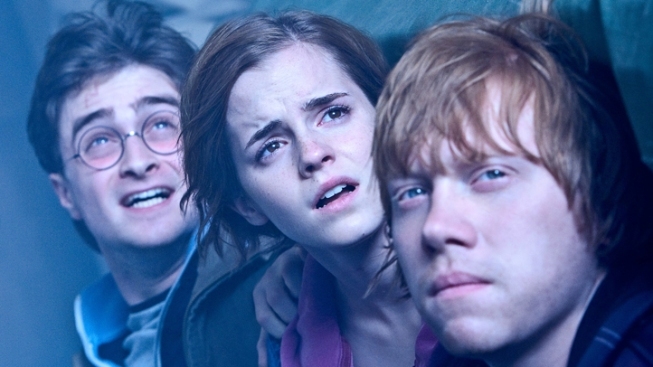 Harry, Ron, and Hermione buckle down for one final perilous Hogwarts adventure. At least where the epic "Harry Potter" films are concerned. In the latest (and possibly last) trailer for the second part of the final flick, we see the eerie and emotional side of the film, where a greasy-haired Snape murmers, "you kept him alive so he can die at the proper moment," a greasy-haired Snape said. We see Harry's dead mother -- who plays a significant role in the books -- tell Harry words of comfort as he confronts Lord Voldemort for the last time. And we hear Harry confess, "I never wanted any of you to die for me."